Fomos em quatro casais e dois adolescentes. A casa Ã© muita boa. ConfortÃ¡vel, bonita e muito bem localizada. A vista Ã© fantastica. Adoramos curtir a lareira e a varanda no apÃ³s ski. Voltaremos com certeza!! We had a great time and enjoyed your place very much. Adoramos nossas ferias de inverno na propriedade do Sr. William! Adoramos nossas ferias de inverno na propriedade do Sr. William! Ficamos muito bem acomodados, e as fotos retratam exatamente com e na realidade. Tivemos todo suporte necessario do Sr. William para podermos programar nossas ferias, com otimas dicas e sempre muito atencioso. Otima localizacao para quem deseja praticar esqui com acesso muito facil aos elevadores! Pretendemos voltar com certeza e ficar novamente hospedado nesta casa que e maravilhosa!! We stayed in early July and had a great time. 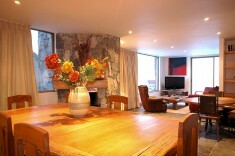 The house is fully stocked - all you need is ski gear and food/drink. William is a great host and once he showed us the path to the resort (so you dont have to drive) we never touched our car again so get him to show you the route on day 1!!! 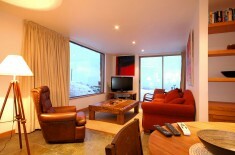 We went to Casa Farellones lower apartment in the beginning of September 09. We had a great experience because of all items included in the apartament and kitchen stuff. The skis resorts are very good (good snow and variety of pistes and off-pistes) and we advise you to shop every food and drink in Santiago and also hire a 4x4 car. The jacuzzi with wine was also very recommended! Hands down this is the best place to stay if you're going to be skiing/snowboarding in the Tres Valles area. I stayed here with a few friends. William was terrific about sharing information and explaining to us all that we needed to know about the area. This chalet has everything you need and more, we were even able to have groceries delivered to us. Also the housekeeper is such a sweetheart, she took great care of us and even prepared homecooked Chilean food. If you are not sure where to stay, look no further - because this is the place. It has a great kitchen, heated towel racks in the bathrooms, bathrooms in each room. Every bedroom has views of the beautiful mountains. I also forgot to mention that the views from the hot tub are probably some of the best in all of Chile, being able to see down to the city of Santiago at night from the deck (where the hot tub is located) is amazing. When I stayed at this chalet, I felt like I was living like "The Rich & Famous" - it just had everything that we needed and desired in a ski-chalet. It's also only a 5 minute drive to Parva - and from there you can get to Valle Nevado with an Interconnect lift ticket. I think this Chalet is the best kept secret in Chile. I am the Canadian from Montréal that stayed at your fantastic house in Farellones with the five New Yorkers. Thanks again it was an incredible trip. Merci beaucoup! Your very own Shangri-la, words would only do it an injustice. If you've stayed with us in the past, we'd love to hear your feedback. Simply get in touch and let us know! We've got more fantastic vacation rental homes! Explore our other rental properties in Big Sky, Montana: Casa Big Sky, Casa Moonlight and Casa Yellowstone. Copyright @ 2012 - 2019 • Casa Farellones. All rights reserved.